These Pumpkin Oatmeal Scotchie Cookies are the perfect combination of pumpkin, oatmeal, cinnamon and butterscotch chips. My all time favorite cookie is Oatmeal Scotchies. Yum! There is just something about those butterscotch chips that I love so much. Since pumpkin is in season, I've been trying to figure out new ways to incorporate it into different recipes. My youngest son loves pumpkin anyway I can bake it.His favorite is Pumpkin Patch Pancakes and my Pumpkin Bread. Carson could eat both of those everyday if I made them. I took a chance and added some pumpkin to my favorite cookie recipe and Pumpkin Oatmeal Scotchies were born. How can you go wrong with pumpkin, cinnamon, oatmeal and butterscotch chips. It just seemed like the perfect fit. My oldest son thought I was nuts adding pumpkin to cookie dough. He told me that I was going to ruin a good cookie recipe. I told him to just give it a chance and see, because you never know you just might like it. I added about 3/4 a cup of pumpkin an the remaining ingredients and then tasted the cookie dough. It was really good I think you can go as much as a 1 cup of pumpkin. I did not add any additional sugar. The only thing I increased was the vanilla extract, but that was the only change I made. When the cookies were baked and cooled, I called in my pumpkin taste tester in and he gave the cookies a thumbs up. I thought they tasted awesome and the pumpkin along with the butterscotch chips were the perfect combination. Preheat oven to 375° F. Combine the flour, baking soda, salt, cinnamon and pumpkin pie spice in small bowl. Beat butter, granulated sugar, brown sugar, eggs, pumpkin and vanilla extract in large mixer bowl or use a stand mixer with the paddle attachment. Gradually beat in flour mixture. Stir in oats and morsels. Drop by rounded tablespoon onto un greased baking sheets. PAN COOKIE VARIATION: Grease 15 x 10-inch jelly-roll pan. Prepare dough as above. Spread into prepared pan. Bake for 18 to 22 minutes or until light brown. Cool completely in pan on wire rack. Makes 4 dozen bars. Those look delish! Gonna be adding those definately! those look so good. I printed the recipe. I do not bake but I will have hubby make them for me. Oatmeal and butterscotch, sounds like a winner to me! I look forward to giving this recipe a test drive. Thanks! Yum! Sound great. I love all the flavors so I'll have to make this one. Wow these look so good, I will have to try them. What a great idea!! 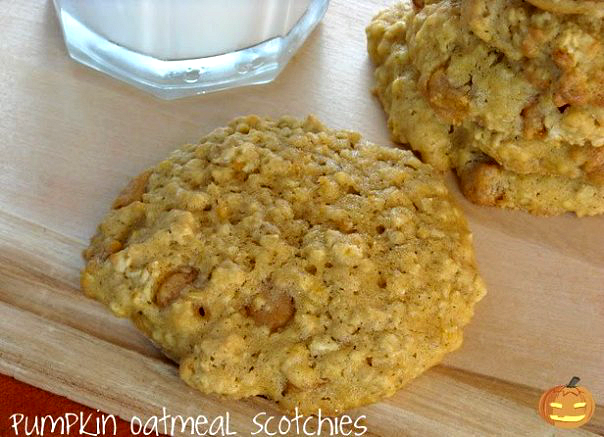 I love pumpkin and I love oatmeal scotchies! !I am definitely going to try these out sometime. Thanks for sharing!! I am on such an oatmeal kick right now! These cookies look sooo delicious - will be trying them this weekend - thanks for sharing! These are out of this world good. Thank you so much for sharing this recipe. It will be well used. Those look delish! I love just about anything pumpkin. Those sound really good. Great idea! Awesome idea to add pumpkin. I love butterscotch too so I hope to try these out soon!!!! Just found my new favorite cookie!!! I have never been a fan of pumpkin in anything, however this recipe was too tempting to pass up!! So glad I tried it! I was looking for something with pumpkin and butterscotch chips, but I'm not much of a cookie baker, but the last line in your recipe sealed the deal! I'll be making these BARS shortly! If you love pumpkin and butterscotch I think you will like these as well. Sounds delicious. ..When it cools down some I'm going to try these! 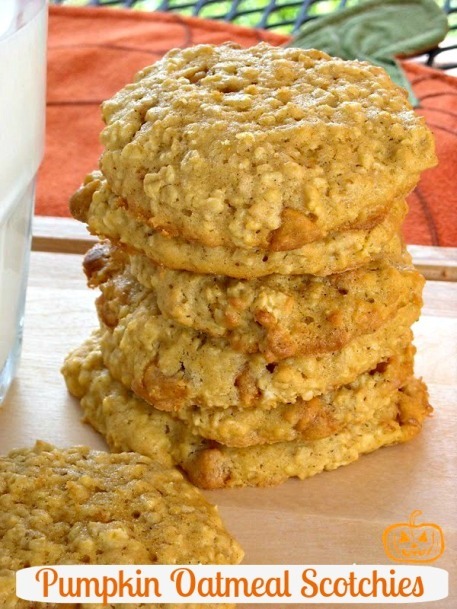 These pumpkin-oatmeal-butterscotch cookies sound great. What size can of pumpkin should be used? Thank you. It states 1 - cup canned or fresh pumpkin puree in the recipe. Any Good? I have them in the oven. Made the bar version with butters itch and white choc chips.